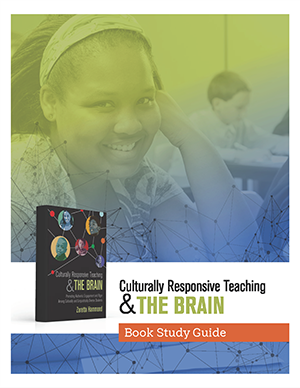 Or maybe your school is reading Culturally Responsive Teaching and the Brain in a book study and you wanted to know more about this Zaretta Hammond chick who wrote it. It doesn’t matter how you got here. What’s important is that you and I are now connected. Since you are an equity-minded educator like me, you are probably waging your own private movement to bust the myths behind student engagement (or the lack of) among low performing students of color, poor students, and English learners. Well, you are in the right place. This is a blog where we can get answers to our collective and individual questions about how we can help students become confident and competent learners. In this space, I want to highlight what I am learning from being out in schools and classrooms with teachers who are successful with diverse students. I want to focus on how we can take everyday strategies and practices and put them to work in their classrooms to be more culturally responsive. Just to let you know, on average, I publish a new post every other week – two times per month at the least (sometimes a few more). That gives me time to be in schools and to write. If you don’t want to miss updates on what I am seeing and learning, sign up for my newsletter by pushing that button below. Books are good, but sometimes you want your knowledge in bite-sized doses. That’s what I like to deliver: consumable, usable, and entertaining food for thought (and action). Here are some of the most popular blog posts and guest podcast interviews to sample. When I was in the classroom back in the day, I taught composition (expository writing). It was where I started to understand how important literacy was to equity, and how neuroscience and culture should inform our instructional practice. 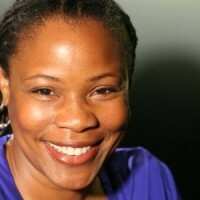 Since leaving the classroom, I have done work as a curriculum designer and professional developer at organizations such as the National Equity Project and the Annenberg-funded Bay Area School Reform Collaborative (BASRC) in the San Francisco-Bay Area. I am a trained facilitator in anti-bias processes and have facilitated groups focused on learning to talk about issues of racial politics and privilege. My primary work has been linking instruction, equity, and literacy. I have spent time as an adjunct instructor at Saint Mary’s College in Norther California where I taught Adolescent Literacy and trained tutors and parents in reading support strategies for struggling students of color. As an undergraduate, I attended University of California, Berkley before finishing up my degree at New York University where I majored in English Literature with a minor in Writing. I completed my Masters in Secondary English Education, with a Concentration in Writing Instruction at University of Colorado, Boulder where I simultaneously did my teacher certification program (starting three months after the birth of my son. I do not recommend this). 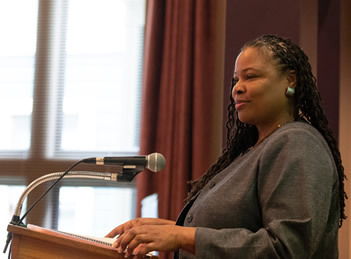 For the past 25 years, I’ve maintained a small, independent education consulting practice from which I do my research and writing as well as support schools doing deep instructionally-focused equity work. I hope this blog inspires, motivates, and challenges you to try some new practices that move you toward being more culturally responsive. If it does, send me a note. I’d love to hear from you. The best way to keep in touch with me is to sign up for free email updates (where you get all kinds of exclusive goodies).